This post brought to you by TRESemmé. All opinions are 100 percent ours. There’s nothing like getting done with a killer workout, only to have to rush back to work or to the next to-do on your list looking like a hot, sweaty mess. 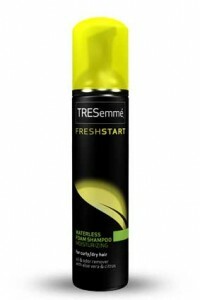 While we haven’t found a way to look as fresh as if you just showered after leaving the gym, we have found a way to help your hair style out tenfold: TRESemmé Fresh Start Dry Shampoo. The full line includes four dry shampoos for all hair types. Strengthening Dry Shampoo has B12 vitamins and keratin, which helps strengthen hair and leaves it full of healthy body. The Volumizing Dry Shampoo has mineral clay and citrus to remove oil while injecting hair with salon-gorgeous volume. Smoothing Dry Shampoo contains vitamin H and silk proteins, which refreshes your straight style by removing excess oil, impurities and odor to ensure your smooth look lasts. And Moisturizing Waterless Foam Shampoo includes witch hazel, citrus and aloe vera to refresh your hair by removing excess oil, impurities and odor, all while moisturizing hair. With a renewing burst of citrus extracts infused into every product in the line, it leaves hair with a clean, fresh scent. I tried the Volumizing Dry Shampoo after a workout and loved it. It soaked up oil near my scalp and left my hair looking like it hadn’t been in a high sweaty ponytail for a three-mile run. The dry shampoo is super easy to use, too. Here’s a quick guide on how to get the most from your TRESemmé Fresh Start Dry Shampoo. If you’d like more tips for making the most of your TRESemmé Fresh Start Dry Shampoo, check out this Top Hair Products for School video by YouTube Celebrity Elle Fowler. She recently teamed up with TRESemmé to teach you how to use TRESemmé Fresh Start Dry Shampoo properly. Check it out! I have had this stuff for a couple of months and it hasn’t worked all that great for me. Although, your instructions do help and I’ll definitely be trying it again. One question though, did you wear your hair down after the sweaty-ponytail? That is I want to be able to do after a work-out without having to re-shower! Thanks!! I use this stuff on in between days and I love it. It works really well for hair that’s a bit oily but you want to skip a wash. I too have used this product, and wasnt too impressed. I will try again with your helpful hints.. I will give it another try!